The Fisher F44 was specifically designed to be an upgrade to the already existing F4. The F4 was an entry level metal detector that had minimal features, aimed at the beginner detector. The F44 has seen a bump in features but a drop in price. This is enough to take a closer look at the F44 and see if it really is a step in the right direction with the advancement. To start things off, you are going to need to assemble the F44 as it will arrive to you in various pieces. Unlike many other metal detectors, this one actually requires the help of a tool. Of course, it is only a screwdriver but still, requires a little bit more elbow grease than with other models. In particular, you are going to need more time to set up the F44 than the F4. This is not the only place that the path diverges between the F44 and the F4. The other noticeable element is the 11” triangulated elliptical concentric waterproof coil. This coil is more ideally shaped to fit into smaller areas and have greater accuracy at picking up objects. The coil is waterproof and can be submerged in water. The lower portion of the stem can also be placed in water but the upper part and control housing cannot. 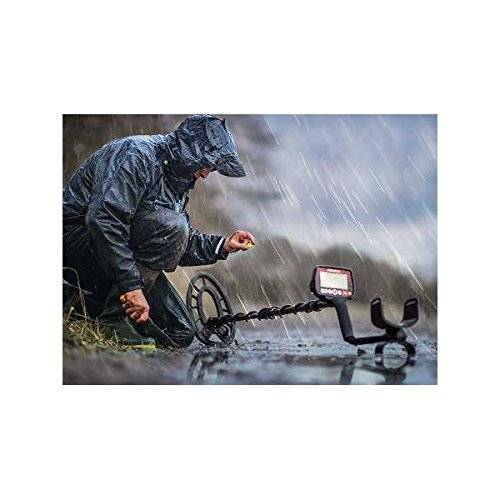 This metal detector is weatherproof, however, and can function even when it is raining. The only catch is that it can’t spend too much time in the water or be submerged. Even the headphone jack can be covered up with a rubber cover to prevent moisture or other particles from getting in. The display is bigger on the F44 than with the F4. In this way, the metal detector is actually closer in design to the F22 as they share a similar structure and construction. The larger display means that the user is able to view a greater amount of information, increasing precision of detecting endeavors. The F44 weighs only a little over two pounds. This makes it excellent for longer detecting trips as you are unlikely to get tired, carrying it around. The armrest, as well as the handgrip, are also adequately cushioned to add to the comfort level of the detector. As noted, the F44 and the F22 share a lot of designs when it comes to the control box. They have similar buttons including the Power, Mode, Pinpoint, selection, and Menu buttons. The F44 has something additional, however, and this is the Ground Grab button. The Ground Grab feature is responsible for ground balance. Jewelry Mode: this is when all of the iron objects are ignored during the search. Coin Mode: when this mode is activated, both foil and aluminum are rejected and not detected by the machine. Artifact Mode: in this mode, all of the target categories are enabled. This means that none of the materials are left out while the machine is being used. Custom Mode: with the custom mode, the settings are programmed by the user. This means that they can assign any tone that they want to a particular target category. The F44 also has a greater sensitivity range than the F22. 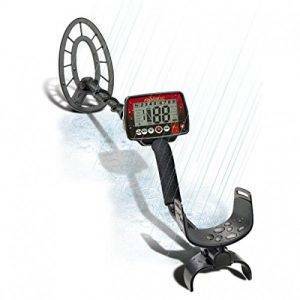 With this metal detector, the range is between 1 and 20, offering a larger number of settings for the users. There are several features that make the F44 a lot more proficient than the F4. One of these is the nine segment Target ID. These nine segments are not just visual but also numerical. They are indicative of probable target IDs that range from 1 to 99. The various materials are placed into a category of their own. When the category is indicated, there is a strong probability that the detector has detected that particular material. 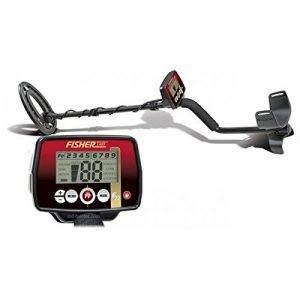 One of the advantages of this metal detector is the fast response. It only indicates the last object that was detected and often ‘clears’ its memory in a matter of seconds. This proves to be especially useful when searching in areas where objects may be quite close to one another. Especially if the good quality targets are closely mixed with the trash items. More specifically, there are Iron, Silver, and Gold indicators. These are in the form of bars, surrounding the target categories. If an object is more likely to be made from one of these materials, the bar around the categories will light up. The other feature that is useful is the four tone identification capabilities. In addition to the visual cues, there are also audio tones to indicate what has been found. These tones include bass, low, medium, and high. You can choose to customize the tone to the category in custom mode. One of the reasons that the F44 is considered to be more useful than the F22 is the Ground Grab feature. With this, you can take into account the naturally occurring mineralization present on the ground. This will result in reduced interference during the detecting process. One of the frequent questions that people ask when thinking about purchasing the F44 is that whether it is worth it. After all, the F22 is available for less and has similar features. This is true but despite having certain resemblances, the F44 is better in this instance. Just the simple fact that it has ground balance means a lot. It makes for greater clarity and fewer interruptions during the detecting. Not to mention, the greater range of sensitivity means that the target identification is more accurate as a result. So, yes, you may have to spend a little more and it may take just a little longer to assemble. However, when you consider all of the advantages of owning this metal detector, these complaints become null and void. Hello Steve, I have been researching before buying my first detector and had pretty much decided on the F44. Your excellent review sealed the deal for me, thanks, and I shall be odering one when back in stock. One question I still have is regarding clubs. I am near Grantham, Lincs, and am finding it difficult to find a local club with member vacancies. Do you know of any? Or at least someone that would allow me to do the digging for them for a day, to learn the ropes? Signed up for the e-book, which I shall look forward to reading. I’m glad that my review was useful, getting feedback is something that I really appreciate. Sadly, I can’t recommend you any local club near Grantham, but I hope that other visitors could help us with this. Please let me know what is your first experience, having an authentic review from you will be really helpful for the rest of the members that are active. Roy, can you please tell how complicated it was for to set up the Fisher F44 once you have it? I purchased an F44 in the US. Initial setup was easy for this novice – about 5 minutes. What is nice is that it easily breaks down to 3 manageable pieces for transportation in less than 2 minutes, and 3 minutes to reassemble. Great visual and audio displays. Hi and thank you for your review just to say the f44 also has an all metal mode and the readout housing has a backlight plus it better be good as I have just phoned in my order😜 keep up the good work!! Thank you, great feedback, Phill! If you can share in the comments what’s your first impression about the F44, other visitors will be curious as well. Hi Steve I’ve put my findings on our 1st outing with the f22 and f44 machines on your f22 page, but i will say I think as a newbie i made the right decision for me by getting the f44 it is so simple to use and has lots of features which you can either use it not. 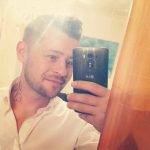 Lovely to now be a detectorist!! I’m really glad to hear that, good luck in your treasure hunting!